Dubai, UAE, October 08, 2018: Oval shaping is the overture to this collection's fascination. The elliptical case of the Balmain Haute Elegance Oval draws the eye, just as the mirror captured Snow White's attention in the famous fairytale. Secured to a fine bracelet or slender strap with the signature Balmain central attachment, these watches fuse finesse with wearability. Asking which member of this family is the most beautiful of them all would be a tough question for anyone to answer, even a magic mirror. The individual models that make up the collection introduce feminine touches from a broad creative palette, including arabesque decoration, as well as black or white mother of pearl dials. Every second counts for this Swiss made timepiece with subtly luxurious overtones. There are black or white lizard patterned straps as alternatives to jewellery-style bracelets. The stainless steel of the cases and bracelets comes in silver, yellow- and rose-gold shades, sometimes in bi-colour combinations. 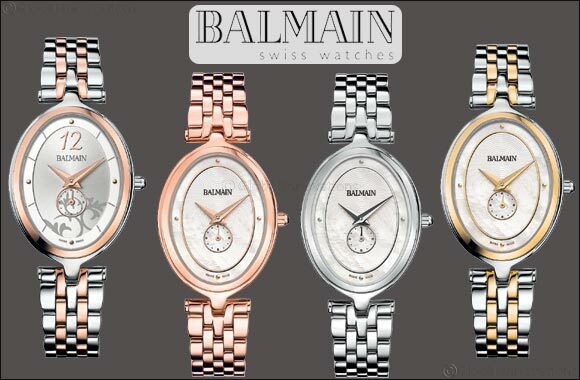 This Balmain Collection ranges between AED 1,620 - AED 1,825 and is available across Hour Choice stores in the UAE.